As one of the greatest rivers in the world, the Nile should be one of the ultimate incentives to visit northeastern Africa. Its waters connect eleven African countries. The Nile's life-supporting powers directly led to the growth and prosperity of ancient Egypt. A cruise to modern-day Egypt will offer you endless opportunities and unforgettable sights, such as sensational sunrises and vast desert landscapes. The Nile plays a vital role in sustaining the livelihoods of cities, towns, and villages that touch its shores, and this power should be celebrated. What better way to do so than to cruise on the Nile and experience Egypt from a refreshing perspective? The Nile is the key to some of the best sights Africa has to offer. 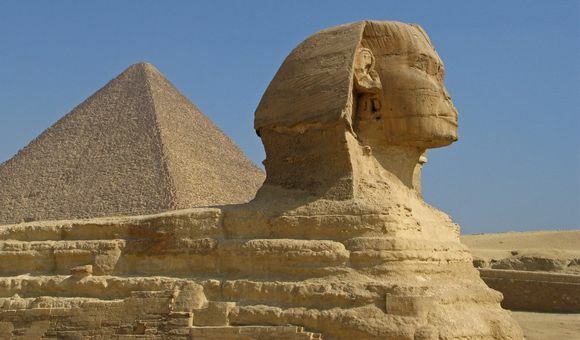 Cruising up the Nile will take you to Egypt, awarding you spectacular views of the pyramids and temples towering above, a trip to the Valley of the Kings, where the tomb of Tutankhamun was unearthed, and a visit to the Egyptian Museum in Cairo. You could also take a break along the way to explore Dendara, Edfu, or one of the many waterside temples. Choose a Nile River cruise that will lead you to the holy Mount Sinai, the ancient Ruins of Abu, the brilliant White Desert National Park, the Monastery of Saint Paul the Anchorite and so much more! Sailing on a cruise ship down the Nile is like travelling backwards through time. With not only modern Middle Eastern cities along the way but also many breathtaking sights still perfectly intact from the time of the ancient Egyptians, you are sure to get the best of both worlds. Cruise lines Uniworld and Viking River Cruises offer fantastic journeys along the Nile on modern, stylish, and purpose-built vessels. Before flying to Luxor to embark on your week-long cruise adventure, stopping along Luxor, Qena, Asna and many other ports, enjoy three days in Cairo with a two-night inclusive hotel stay. Enjoy one last night relaxing in a hotel before flying back to Cairo. While you have the opportunity to enjoy guided tours to Egypt's most famous landmarks, the lesser known botanical garden of Aswan on Kitchener's Island is a worthwhile visit. This Uniworld cruise will take you on a twelve-day voyage, visiting the wondeful spectacles of Egypt. Enjoy hotel stays in the modern city of Cairo before flying to Luxor to board the modern ship River Tosca. You will enjoy a life-changing journey on board. To really get a feel for what life was like for ancient Egyptians living on the banks of the Nile, be adventurous and enjoy a ride in a felucca, a traditional Nile river sailboat. Situated on the east bank of the Nile, Luxor is the southern Egyptian city that serves as the capital of Luxor Governate. The city has earned the nickname of the world's greatest open-air museum because the temple ruins of Karnak and Luxor are still standing in the city. Just across the Nile lie the monuments, temples, and tombs of the Valley of the Kings and Valley of the Queens. Aswan is a southern Egyptian city on the east bank of the Nile. Serving as the capital of the Aswan Governorate, the city is a bustling centre for markets and tourists. Aswan offers many opportunities to see and learn about Egyptian ruins, sitting at the southern frontier of ancient Egypt. The region's granite quarries provided raw material for the production of sculptures and obelisks. Sitting near the Nile Delta, Egypt's capital, Cairo, is the largest metropolitan area in both the Middle East and Arab world. Cairo plays a major role in the region, acting as the centre of politics and culture and boasting an impressive collection of both traditional and modern Islamic architecture. To this day, Cairo is still associated with the ancient world with the famous Pyramids and the Great Sphinx of Giza just next door. Esna is an Egyptian city located on the west bank of the Nile just 64 kilometres south of Luxor. While most famous for the preserved pronaos of the Temple of Khnum, the city has its own rural charm. A market, filling a couple of streets leading inland from the corniche, has been a hot spot for tourists. The Roman temple, sitting about nine metres below the streets of the old town area, has only been partially excavated. Situated between the southern Egyptian cities of Esna and Aswan on the west bank of the Nile River is the town of Edfu. Its location in the fertile Nile Valley justifies the town's agricultural prowess, especially in sugarcane production. Edfu is most known for the remains of the town's ancient settlement and the most completely preserved Temple of Horus, spared from the destructive Nile floods. 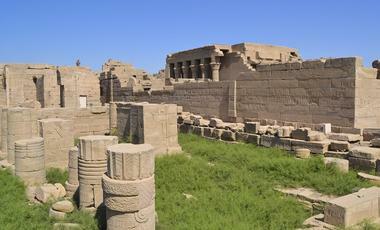 The farming town of Kom Ombo sits on the banks of the Nile, about 50 kilometres north of Aswan in Egypt. The town's position gave it control over some trading routes from Nubia to the Nile Valley. Kom Ombo is famous for its eponymous twin temples, which were erected in the second century BC, signifying the town's rise to prominence. The temple ruins spent years buried in sand until French archaeologist Jacques Jean Morgan rediscovered them in 1893. The Egyptian city of Qena is situated on a major bend of the Nile as well as at the intersection of two main roads: one that runs alongside the river and one that traverses the desert to the Red Sea. This market town is also the capital of the province. Many travellers use this junction as an opportunity to visit the neighbouring temple complex at Dendera. Egypt is a land of ancient splendour enriched by centuries of culture. Along the narrow ribbon of the 1,545-kilometre River Nile, dynasties of Kings and Queens created monumental legacies that will fascinate you. 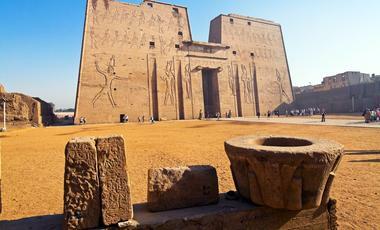 Nile cruises visit a wider variety of antiquities along the banks of the river. 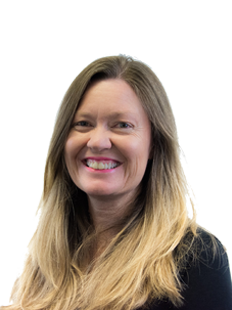 But equally important, they also allow the tourist to gain a prospective of the rural Egypt, where people live much the same way they did even thousands of years ago, in mud-brick homes, tending their fields with wooden ploughs and moving produce via donkey. It is a wonderful experience to sit on a shaded deck of a floating hotel, sipping an iced beverage while watching 5,000 years of culture slowly drift by.